I snapped these photos quickly with my cell phone and for some reason, they’ve all got a blue cast to them. I took the photos because I’ve been meaning to post about a little project that’s been ongoing for what feels like half the summer. 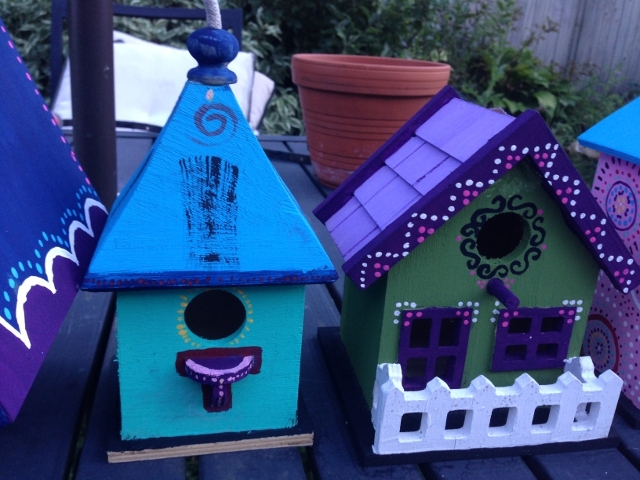 We’ve been painting bird houses. Some days, friends come over and paint one, too. They keep their birdhouse, of course, so what you see here is probably only half of the birdhouses that have been worked on this summer. Sometimes the painting is a collaborative affair with multiple people working together to produce a single house. Sometimes there are more layers of paint than you realize as houses go from pink one day to red the next, and blue the day after that. The houses are from the dollar store for the most part, prebuilt and ready for decorating however you please. The big one (second from the left in the first photo) is a build-your-own kit from Lowes or Home Depot, as is another one shaped like a barn that is not yet finished, so I wasn’t allowed to photograph it yet. 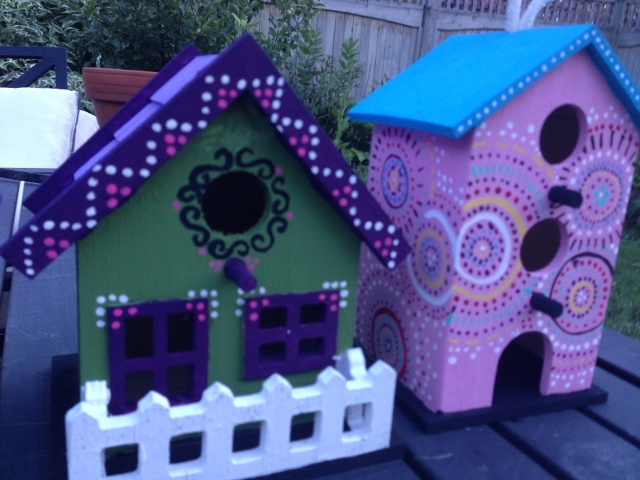 I’m not entirely sure what we’re going to do with all these bird houses. We might do a yarn-bombing type event and decorate a school yard fence for a day or two. We might randomly leave them on neighbours’ porches with a little note of appreciation for being such good neighbours. Or we might just put them all up somewhere in our backyard as a colourful counterpoint to all the white stuff that we know is coming in a few short weeks. But not just yet. For now, I rather like looking at them as they sit on the table all in a row, cheerful and happy little things that they are. Googly eyes are ridiculously fun. Seriously, ridiculously fun. And when you buy a giant bag full of googly eyes, you can have fun all over the place. Like at the crosswalk near the bakery. Or on a lamp post. Or on the side of a newspaper box on the way to the library. But best of all, if you get some of the really, really big googly eyes, you can have a little bit of fun with every fire hydrant you can find. Have you ever had a day that you know perfectly logically is an unusual sort of day that only happens once a year, yet at the same time feels so comfortable and familiar that it sort of feels like coming home? The day before the first of July, we took Auntie N to the RCMP stables for the Sunset Ceremonies. They take place only once a year here in Ottawa, and it is well worth going. The police band plays, there is a pipe and drum band performance, and agility dogs and horse jumping and other skills, plus the RCMP demonstrates some of their more technical skills, including chasing down a bad guy in a minivan amidst much noise and smoke and cheering. The main event is the Musical Ride, and oh, is it ever something to see! I never tire of watching those beautiful horses wheel around in all sorts of patterns. They perform on Canada Day every year as well, but the crowds tend to be crazy and unless you are willing to stake out a spot very, very early in the morning, you won’t see much more than the tips of their standards as they gallop and wheel around the front lawn of Parliament Hill. When that pipe and drum band marched in, I just knew that I was exactly where I needed to be for the next couple of hours. There is something about listening to bagpipes and drums that makes my heart happy. The dancers were lovely, too, but it is the band that makes me settle further back into my chair with a smile on my face and a deep sense of joy resonating through my core. The kids liked watching the dogs get put through their paces. They liked sitting in a truly all terrain ATV, too. And when a minivan darted out onto the field with RCMP in tactical vehicles in hot pursuit, K practically vibrated with excitement. The Musical Ride is, of course, the highlight of the evening, and I never tire of watching them wheel and turn and charge as they run through the patterns that make up their performance. But I think the highlight of the evening this year had nothing at all to do with what was happening in front of us. In fact, it took place while we were waiting for the show to start. While waiting for the performance to start, I pulled out a couple of bottles of nail polish I had stashed in my bag before we left and I went to work on B’s fingers, to her great delight. Or rather, it would become her great delight, but at first, it involved much negotiating. Or arguing, depending on your point of view. “Yes, you do.” I told her. She gave me the most skeptical look a 10 year old has ever given their mother in the entire history of 10-year-olds’ skeptical looks. But she let me do it. And after the white had dried and she, still frowning, expressed once again her great doubt about the benefits of white nails while I got out the red and started working on the second layer. Canada flag nails. I gave my daughter Canada flag nails for Canada Day. We did the first hand in one direction, and the other hand in the other direction, because I wasn’t sure which would look better. She loved them so much, she insisted I take a photograph of them. She loved them so much that when Auntie N offered to snap a quick family portrait, she held up her nails to make sure the camera wouldn’t miss them. Personally, I didn’t notice them. I was too busy being blinded by my children’s beautiful smiles. We do like attending the RCMP Sunset Ceremonies oh so very much. Today was supposed to be a day full of thunderstorms and rain and with two children fully rested now after a few days of no school, I spent last night planning and plotting as to how I could keep them suitably entertained and exercised while at the same time finding enough hours in the day to get my own work hours in. Mother Nature, of course, declined to cooperate, and our day, while not at all what we planned, turned out to be marvelously wonderful. The children slept in, as they have been lately, and I managed to log several hours of uninterrupted work before they started moving around. Then, while they lounged about in pyjamas playing on various electronic devices (a luxury resulting from Mama being hard at work and not entirely paying attention to anything other than the fact that they were quiet and hadn’t ventured out of their rooms), I kept working as long as I could. I fully expected I would soon be interrupted, but I wasn’t. Instead, I was distracted by a car pulling up across the street and some familiar-but-not-recently-heard voices. Our neighbours were finally, at long last, home! They have been away for 3 years in Germany, you see, and we have missed them. The kids have grown enormously, though their adorable faces are still recognizably them in the way that kid faces tend to be, while at the same time being oh-so-different and more grown up and a curious mixture of welcoming and shy. What else was a Mama to do but shriek with joy, bully the kids into real clothes, and rush outside to dispense hugs and hellos and more hugs in the midst of much happy chatter. And, with the rain keeping its distance despite the almost suffocating humidity, the whole gang of us — two Mamas and six kids and a wagon full of sand toys and soccer balls and water bottles and snacks — headed up to the park for a good long romp (and a good chat) that somehow felt like we surely had done this just yesterday, even though it has been quite literally years since they were last home for more than a quick visit. We kept looking at the sky, us Mamas, but the rains, though threatening in a sort of nonspecific hazy way, failed to arrive. The sun, while not shining brightly, exactly, was strong behind the oppressive overhead haze. We made tentative plans to go swimming in their pool after a quick bite of lunch and a few minutes of rest and off we went our separate ways… only to have the rains finally arrive at long last. Out came my much delayed rainy day plans: A Lego challenge, and a movie-making adventure. I challenged them to build a car out of Lego, then use the movie app on the iPad to make a movie using their car. They were excited at the prospect and immediately built a wonderful pair of vehicles. B’s is rather conventional, with four wheels, a driver behind a windshield, and a trunk complete with a suitcase full of money and a decapitated Lego minifigure head inside a motorcycle helmet. Because every Lego car needs a decapitated head and a suitcase full of money in the trunk, don’t you think? B laughed herself sick when I declared it so, insisting that she had not put a decapitated head in her trunk. It was just a helmet. Like an ordinary helmet. It just so happened that the minifig head was stuck and so the helmet came with a head of its own. But not a decapitated head. Just an ordinary head. And couldn’t I just pretend that the head just wasn’t there? K’s Lego vehicle was somewhat less traditional a car. It didn’t have wheels, for one thing. Landing gear, yes, but no wheels. And it flies. Because who says cars won’t fly in the future, right? I think I need a flying car. And during the whole “Is that a decapitated head in your trunk?” conversation, he sat off to one side smothering his laughter behind a far too grown up look of amusement before finally taking his sister’s side and insisting that I must have misinterpreted the contents of her vehicle’s trunk. I left them to their movie making then and got back to work myself while they made props and signs and gathered up Playmobil and other assorted pieces to assist with their movie. They never did get to making the movie, though they’ve now got it all planned out — and it isn’t going to be a movie, I’ve been informed. It’s a movie trailer since those are shorter. They might make the movie later. But they are definitely making the trailer. As for the title of their movie about a car that flies and another car with a trunk that most definitely does not contain a decapitated head inside a motorcycle helmet? Coming soon to a theatre near me. Today was the last day of school for the summer. It is a joyful thing for students and teachers alike, this last day, marking the beginning of summer and the end of homework as it does. It is a bittersweet day too, as today marks the last time K will walk through those doors as a student. The last time he will sit in a classroom with (mostly) the same group of kids he has been with since his very first day of kindergarten at the ripe old age of 4. And the last time he’ll be at the same school as some of his closest friends. Eight years ago, I took what would become the first of many photos that look almost exactly the same, except the kids are taller in each one. At the end of K’s very first day of school ever, when I asked him how his day was, he chattered on and on in that funny way he had back then of garbled words and dropped syllables and every word starting with “d” and helped by plenty of sign language to say what his hugely delayed verbal speech couldn’t get across. Every morning, we walked to school and I kissed him goodbye at the gate to the kindergarten yard. He was so small, the latch was far beyond his capabilities, yet almost daily he would try to climb the gate to gain the leverage necessary to undo it so that he could hurry in and play with his friends. Two years later, he graduated to the grade 1-3 yard and it was B who eagerly tried climbing the gate to open that latch and get to where her people were playing. He loved that yard. She loved that yard, too. That gate, black metal and oh-so-tall compared to such tiny little people, is the doorway to so many memories. It has changed very little over the past 8 years. They switched which side it opened on a few years back, and it is a little worse for wear around the bottom where the snow piles up in the winter. The grassy part of the yard that was an mud pit every single spring was paved over one year, much to my dismay. The fence, too, has changed not a bit, though the greenery planted around it has grown taller. And the bike racks haven’t changed one bit. The yard seems like a cheerless place from this angle, I must admit. What these photos don’t reveal is that two entire sides of the school are surrounded by lush green lawns and parkland with an additional pair of structures, a soccer field, basketball nets, and other goodies. The school adjoins a park as well, and they take advantage of it often, especially the skating rink in winter, and it isn’t unusual to find classes exploring the woods and the ravine I blog about so frequently. But it is true that, on first glance as you enter the premises, it is a vast desert of concrete ground and iron railings. As it happens, one of B’s friends was out for a walk with her parents and she stopped to see what we were doing. When her parents carried on walking, she stayed behind and offered moral support. This morning, I just happened to bring the camera to school (how could I not after such an epic evening!) 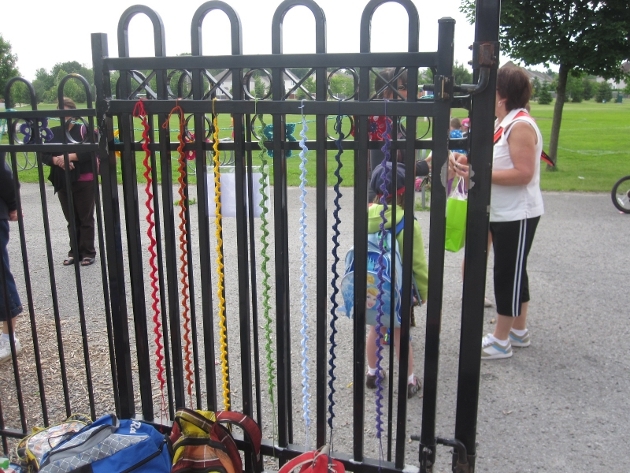 and we delighted in watching kids petting the rainbow sleeves on the bike racks and batting at the flowers and making the gate’s spirals going “sproing” one colour after another. It made me smile to see so many children taking joy in our little bit of silliness. And it made me laugh to see how many parents didn’t even notice until their children pointed it out to them. And as for that gate, that well-used and well-loved gate… seeing it piled round with its daily accoutrement of backpacks and jackets topped by a sproingy rainbow that kept getting played like a guitar? That was the most perfect bit of silliness of all. I am, by nature, the kind of person who likes a well planned out week. I like knowing what is coming next. I like looking at my calendar and seeing everything we need to do alongside all the things we are thinking about doing. I even like planning for events. Christmas, with all its decorations and food and fun family traditions that don’t look like traditions. Halloween, with costumes and pumpkins and porches full of spooky things. Easter, with egg hunts and cookies and family all around. And birthdays. I love planning birthdays with the kids. There’s something about a celebration, be it a big one or a little one, that makes my heart happy. Last night, we were blessed with another kind of celebration. A first for us, and one which will only be repeated once more for our little family of 4: a grade 6 graduation ceremony. Tomorrow, you see, is a certain young man’s very last day at the school that saw his very first day of school ever. It was a funny sort of celebration. A chance to honour some amazing kids who have accomplished some amazing things. A chance to see how those funny, happy, giggly little 3- and 4-year-old kids from the first weeks of kindergarten have turned into some of the most accomplished and talented 11- and 12-year-old kids you’ll ever meet. And how others, not distinguished academically, not outstandingly talented at sports or music, still got the recognition and celebration they deserved for talents such as “always willing to lend a hand” and “always cheerful” and “passionate about history” from teachers who understand that every single kid deserves a huge shout out for having the courage to be themselves. Tomorrow, the entire school will be celebrating their last day for the year with a morning filled with special activities and games and pizza. A good time will be had by all, I am sure. But tonight… tonight, I have a plan. A completely silly, wonderful, and oh-so-fun plan that firmly falls into the category of a Silliness Project plan. A sneaky, devious, and playful plan that will hopefully bring a smile or three to all those young faces celebrating their imminent freedom from school tomorrow. It involves a whole bunch of these crochet flowers and a few crochet corkscrew spirals and a few rainbow strips for good measure. I am always surprised by what comes up as my most frequently viewed posts on this site every week. You would think that over time, older posts would drop off out of memory and newer posts would be trendy and often looked at. Not so. Oh, sure, newer posts get a ton of views for a day or three, but there are several posts that are just so darn persistent. They show up in my list of top posts for the past week every… single… week. There are five posts that I’ve written that have gained this incredible stickiness — without my doing anything to promote them. I find it curious that these five topics get searched for (and found) so often. I find it curiouser that, despite several of them being 3+ years old, not a week goes by without at least 3 of these 5 posts showing up in my list of top posts for the week. This week, all 5 of them are there. 1. Polymer science with jelly balls. 2. From Coca-Cola to terrarium. 3. Crossbows and pencils and electrical tape, oh my! 5. How to build a better volcano. The one thing they have in common is that they are all crazy things I have done with my kids at some point. Some are based in science, others based in art, and all were just plain fun — if you find doing slightly crazy and possibly dangerous things with kids to be fun. And yet, this year, we have hardly done anything that truly qualifies as slightly crazy and possibly dangerous. Not since November 2012, at any rate. Not really. I blame it on school. This has been, bar none, the most time-consuming school year ever. Between homework and band practices and more homework and extracurriculars and yet more homework, we just haven’t been up to our usual shenanigans. We’ve done a few things, like the Radical Structures workshop at the library a few weeks ago (which I totally didn’t tell you about, nor did I post pictures) and the annual front yard snow fort that grew far taller this year than it ever has in years past (and I also didn’t tell you about, nor did I post pictures, for I actually forgot to take pictures), and K has become completely enamoured with learning computer programming thanks to Virtual Ventures at Carleton University (yet another thing I haven’t told you about. Apparently I’ve been rather secretive about the coolest things we’ve been doing these last few months). But despite all that busy-ness, we haven’t done anything crazy. Because really, if you think about it, the one thing that those 5 posts have in common is that they are slightly crazy. Maybe even more than slightly crazy. And seeing them up there week after week reminds me that one of the things I love most about being a parent is getting to do slightly crazy and possibly a little bit dangerous things with my kids. And building penny shooting machines. My goal for this upcoming weekend — and yours too, should you choose to accept the challenge — is to find something slightly crazy and rather silly and possibly even a little bit dangerous to do with my kids. Preferably something that makes us laugh until we are breathless with it, our souls shining with joy inside and out. I call it The Silliness Project. Who wants to join me?